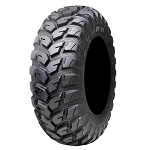 The EFX Moto Claw tires are a new 8 ply radial tire designed for UTV & ATV applications. It's also DOT approved for use on the highway in select sizes. EFX has an excellent reputation for their tires and the new Moto Claw is no exception! These tires are built to last and will provide a nice smooth ride on the pavement and give you enough traction for go off-roading. 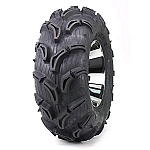 If you are looking for a tire that has an excellent tread life and a really nice ride the Moto Claw would be a great choice! - 6 ply Bias on 26 & 29 inch sizes. - 26-9-12, 26-11-12 & 29-10-16 are NOT DOT approved or Radial. This is a tough and awesome looking tire. Rides great on pavement...that is why I opted for a radial. Have to ride blacktop to get to creeks and trails locally. They added approx 2 1/2" ground clearance from stock setup on Polaris Ranger. Very aggressive tread, 1" lugs!!! Great service. I bought my RZR Jagged X with Big Horns on it. Noticed real quick that the BH's, while being an excelent tire it does have it's soft/exposed areas that are very susceptible to the sharp rocks of the Arizona hills. Looking for a 8 ply tire, I found these. Not only are they DOT rated, they are an excelent rock, steep climbing, smooth riding tire. I luv'em. Great looking tire! Love the extra side wall protection. Biggest dislike is that they are not 27" on 7" wide ties. They measure only 26" I have had them out in snow and soft dirt, plus high speed dirt roads. They performed great. They are stiffer than my stock bighorns. I am sure part of this is them being new. I've had MotoClaws on a few UTVs now and I really can't think of a better tire. Sure they're a little heavy, but I've driven over all kinds of gnarly stuff (mesquites, cacti, etc) and never had an issue. I ride mostly rocky, hard pack areas and they've always performed well. 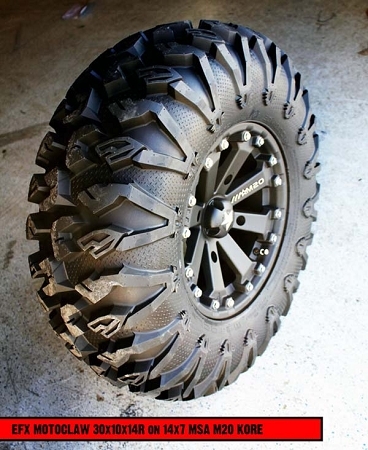 These tires are just want my UTV needed to make it much more of an all around awesome ride. I put these on my 2015 XP1000 and I am not dissapointed. They perform just perfect in loose sand, light mud, gravel and soft to packed dirt. They give me a big bold look and a punch in the handling department. The shipping was super fast and they fit my 14"x7" Beadlock wheels with ease. I am very pleased with the overall experience. Thanks Pure Off-road. Great tires ,great traction ,love the ride these tire can take a beating. The guys at Pure OffRoad are great! The shipping truly was lightning fast... The EFX tires are everything I hoped they would be. They look tough!! I don't think the Ozark flint rock will be able to penetrate this tire. 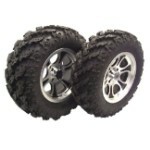 Q: How come the 26" motoclaw tires are not radial and will there be some in the future with this size? A: I'm not sure why they did it that way. They are offering some sizes in radial DOT and other sizes they aren't. No I don't think they have any plans to make the 26 inch radials. 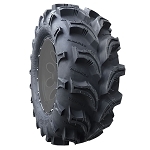 Q: Does anyone know the true tire height of the 32" EFX MotoClaw tire? Manufactures always claim these sizes however are normally not true if you measure them. The Outlaw 2's are the only tire I have seen to stand true at 34.5" tall. Even stock RZR 1000 tires claim 29.5" however are a true 28" tall. A: The 32 inch MotoClaw measure a true 32 inches tall when mounted on a 7 inch wide rim. Q: my stock tires are 25×8×12 and 25×10×12 will the 26×9×12 and 26×11×12 still fit my rims? Q: the price included tire and rim? Q: Hello. I have a 2016 RZR 1000 XP stock rims. The 30x10 -14 moto claws tires have the real measure size? I mean are bigger than the maxxis bighorn 29x9-14? A: They usually measure a true 30 when mounted on a 7” wide wheel with 15 lbs of air. But the spec is +/- 10% so it is possible to see a tire not measure exactly at the 30”.